Be the first to share your favorite memory, photo or story of ELEANORA. This memorial page is dedicated for family, friends and future generations to celebrate the life of their loved one. 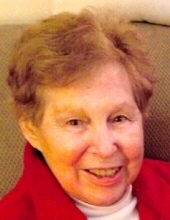 Eleanora Elizabeth Estok (nee Bakale), age 89, of Euclid, passed away Wednesday, January 16, 2019 at her home with family members by her side. Born February 19, 1929 in Dunlo, PA she had been a resident of Euclid for the past 64 years. Ellie was the beloved wife of John for 64 years; loving mother of Sandra (Roger) Lundblade, Korie Rossman, and Ellie Murphy; cherished grandmother of 8 (Jeremy, Jonathan, Raymond, Lisa, Jeffrey, Kimberly, David and Lauren); great grandmother of 10; aunt of 48 nieces and nephews. She was preceded in death by her parents Stephen and Barbara Bakale (nee Matlin). Ellie was the 5th of 12 children, the dearest sister of Marianne (Tony - deceased) Naglic; Stephen - deceased (Marge); Robert - deceased (Marge); Mildred - deceased (Michael - deceased) Fedore; Ernest (deceased); Edward - deceased (Patricia - deceased); Dolores (Anthony) Gwizdak; Joseph - deceased (Anita); Betty Jane (Edward - deceased) Pristas; Barbara (David - deceased) Wess; Darlene (Steve) Berzansky. Ellie was a medical receptionist for Dr. Donald Vogel for many years. She also held the position of secretary of the Croatian Lodge 235. Ellie and her family were longtime members of Holy Cross/Our Lady of the Lake Catholic Church. She enjoyed crocheting, reading and attending the many sporting events of her grandchildren. She also enjoyed going out to eat, going shopping and her many vacations to Florida. Ellie loved the companionship of her dog, Snuffy. Family will receive friends from 3 to 7 p.m. Monday, January 21 at Brickman Bros Funeral Home, 37433 Euclid Ave, Willoughby. A Mass of Christian Burial will be held on Tuesday, January 22 at 11:30 a.m. at Our Lady of the Lake Catholic Church, E 200th St and Lakeshore Blvd, Euclid. The family would like to thank Ellie’s caregivers for their compassionate, caring presence at the end of her journey. Please consider a donation to Great Lakes Caring Hospice, 5966 Heisley Rd, Mentor, OH 44060. "Email Address" would like to share the life celebration of ELEANORA E. ESTOK. Click on the "link" to go to share a favorite memory or leave a condolence message for the family.